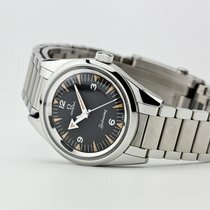 Omega Seamaster Railmaster Automatic 40mm - 220.12.40.20.01. The Railmaster has been part of the Omega catalog since 1957. Thanks to the state-of-the-art Master Chronometer caliber, current models can withstand magnetic fields of up to 15,000 Gauss. The Co-Axial escapement also protects it against jolts. Even though it's not a diving watch, the Omega Railmaster is still part of the Seamaster family. 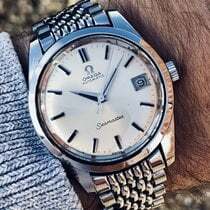 The Railmaster and the Seamaster 300 were initially presented together in 1957, and the similarities are striking. With their triangular hour indices coated in yellow-orange luminous material; simple Arabic numerals at 3, 6, 9, and 12 o'clock; and glow-in-the-dark hands, you could easily mistake one for the other. The main thing that differentiates the Railmaster from its sister model is its lack of a diving bezel. As its name suggests, the Railmaster was initially developed for railway workers whose work included regular exposure to strong magnetic fields. However, doctors and scientists also benefited from this watch. A soft iron cage protected its movement against magnetic fields of up to 1,000 Gauss. Thanks to Master Chronometer technology, the Railmaster has been able to withstand magnetic fields of up to 15,000 Gauss since 2017. This is only made possible by using modern, non-magnetic materials like silicon and titanium for important components, including the balance spring, escape wheel, and the movement's axles and centers of rotation. All this make a soft iron cage redundant. How much does a Railmaster cost? The original Railmaster models bear the reference number CK2914. They were produced until the early 1960s, are 38 mm in diameter, and water resistant to 60 m (6 bar, 197 ft). You can get a well-maintained example of this vintage watch for around 15,700 USD. Models from the mid-60s are a bit more affordable. Those with the ref. 135004 cost about 12,800 USD. 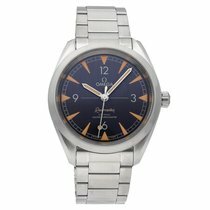 Shortly after the turn of the millennium, Omega released an updated version of the Railmaster. While the dial was similar to that of the original, the stainless steel case had grown to 41 mm in diameter. What's more, the watch was water resistant to 150 m (15 bar, 492 ft) and outfitted with a Co-Axial escapement. This feature makes the watch less sensitive to shocks and jolts. Pre-owned pieces in good condition demand around 2,800 USD. Be sure to have an extra 1,200 USD on hand for a never-worn example. The early 2000s also saw the introduction of the Omega Railmaster XXL. At 49 mm, this watch was especially large and came with a small seconds dial at 6 o'clock. Prices for this timepiece sit around 4,100 USD. The current edition of the Railmaster premiered in 2017. Its case is now a moderate 40 mm in diameter, and a Co-Axial Master Chronometer ticks away inside it. This caliber can resist magnetic fields of up to 15,000 Gauss, a value 15 times greater than that of the original Railmaster. The dial also got a bit of a facelift. The minute scale now resembles a railway track, and the dial itself has a vertical satin-brushed finish. A central compass and a lollipop second hand round off the new design. You can choose from an anthracite or silver-colored dial and a textile, leather, or metal band. No matter what version you choose, expect to pay around 4,000 USD. In summer 2018, Omega announced another color option for the Railmaster: denim. This edition features a dial with the same vertical satin-brushed finish, but this time it is denim blue in color. The NATO strap is made of denim as well. The color and a price tag of about 5,200 USD are all that separate this Railmaster from its sister models. The Railmaster 1957 Trilogy 60th Anniversary was created to celebrate 60 years of the Railmaster. This model is optically identical to the original. However, look inside the case and you will find a Master Chronometer caliber with a Co-Axial escapement. Limited to a run of 3,557 pieces, this timepiece costs around 6,600 USD.